Here is an academic IELTS report submitted by one of our students. Send us your writing samples for a free band score estimate or get a detailed analysis of your writing for a fee. 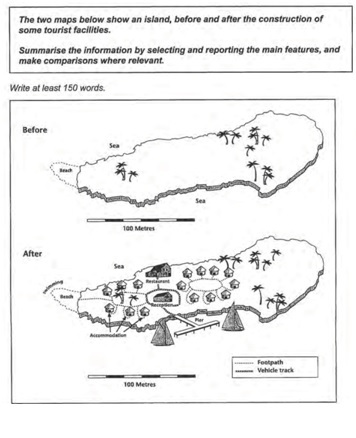 From the given maps, it can be seen how an island has changed after it is developed for tourism. Overall, while the west and middle parts of the island have been developed, the east part has remained the same. First, speaking of new developments on the island, two clusters of tourist homes have been built both in the east and central parts of the island. Footpaths have also been built connecting each building. There is a restaurant between the residential buildings near the north coast. Moreover, to the south side of the restaurants, a reception centre, connected to a pier, has also been built. At the same time, roads are built to connect the pier with the reception area and the restaurant. As for the changes to the coastline, a swimming area has been set up alongside the beach of the westernmost coastline. Furthermore, a pier, which provides direct access to the reception centre and boat sports area, has been constructed on the south coast.